Hey guys, it’s been a while since I’ve posted anything here. I sometimes find it hard to find a topic I think people will actually care to hear about. But I thought I’d share this blog with those of you who don’t already know it. I stumbled across it on tumblr a couple months ago, and I think the work this person does is amazing! 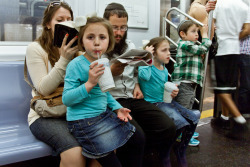 visual library featuring the Reading-Riders of the NYC subways. It expects to house over a thousand images by 2013. This library freely lends out a reminder that we’re all capable of traveling to great depths within ourselves and as a whole. 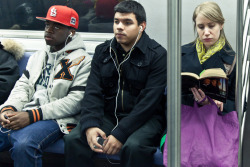 The NYC Reading-Riders are a plentiful and diverse group. They’re engaged in a simultaneous journey, one that takes them towards their daily pursuits as well as towards a greater sense of themselves and our world. This project takes a closer look at them in celebration and revelation. What I love about Ourit’s project is not just the appreciation of reading but also the fact tha t in order to take all those photographs she has to actually LOOK at her surroundings instead of just mindlessly gliding through everyday life. I think that once you walk through the city with open eyes, trying to take it all in, you notice that so many fleeting but amazing moments take place – a sideway glance, a smile, a short interaction between strangers, the play of light on water. I think those tiny magical moments are part of what makes life worth living. When looking at her pictures, it’s like I get a tiny snippet out of another person’s life. I look at the titles of those books, and I wonder what the person’s motivation for reading them might be. I like the diversity of both people and genres or book formats. Photos are not the only posts though, there are discussions about street photography and its ethics in general, about the role and significance of reading, about the relation between books and eReaders. Also, Ourit has written a couple poems made up entirely of the tumblr usernames of those who like or reblog her entries! Interesting question. For some reasons, I happen to know that people can react very differently to being photographed. Well, if you do so from afar and then just kind of disappear again, they might not even notice that it was them you took a picture of; if they do they might give you rather irritated looks (which I can totally understand, btw) and if you get too close, well, they might notice and give you irritated looks and walk away even before you were able to press the trigger on them, so, maybe it’s wrong to just shoot people – oh the ambiguity : P . No, what I meant to say is, that maybe asking them first would be the way to go. But then, could this still be referred to as Street Photography in the original sense? Do you know how she came to solve this problem? Because for me the solution is not to take photos/shoot films in crowded places resp. not take pictures of strange people whenever it can be avoided resp. when I can resist the urge to doing so anyway which actually is most of the time. But that’s just me spending most of my waking hours being a great big coward and avoiding situations where there could be conflict/interaction with strangers or people on the whole. It definitely feels weird to find out that someone has been watching you and has captured and posted your image without your permission. It feels like you’ve been stolen . . .
Stealthisbook, I think you have a point but it’s not even that simple. I believe that you can’t invade privacy of other people and use them as you like. It is true though that a tram/bus is a public space on wheels, but if you are not in the pic yourself, you can’t have the right to use that pic unless you ask the people that are in it. I don’t know how they did in New York, and it would be interesting to know. Of course, if the photographer is a professional, then I guess he/she has the right to take pics on public territory, as he/she uses them for information. How does it works here in Switzerland? I’m a Swiss, but I never thought of asking someone and my family and friends wouldn’t know either. But the project to do it here is appealing. I would join the group if we made one! Does someone know how it is in the UK with privacy rules and pics? I’m going three weeks to a summer course in the UK and could start photographing… If I knew the rules that is.